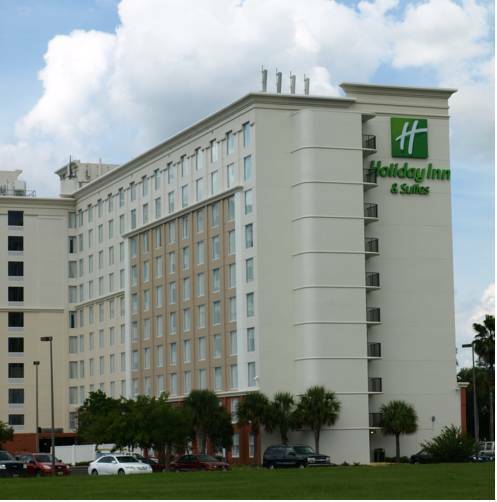 The Holiday Inn & Suites Across from Universal Orlando is centrally located to everything Orlando has to offer. Located directly across the street from Universal Studios , the thrilling Universal's Islands of Adventure , and the excitement of Universal CityWalk entertainment and dining complex, we are where you want to be in Orlando. Our Orlando hotel has everything you need for a fun, holiday vacation or business trip to Central Florida. Our Holiday Inn and Suites is an easy walk to Universal Orlando and is just a short 15-minute drive to the Walt Disney World Resort, where you can experience the magic of the Magic Kingdom , EPCOT , Disney Hollywood Studios, and Disney's Animal Kingdom . SeaWorld Adventure Park, Discovery Cove and the renowned International Drive are less than a 5-minute drive, along with all the outlet malls such as Orlando Premium Outlets - International Shopping center, and the Mall at Millennia. Over 100 dining and entertainment venues are within close proximity to our hotel. Great All American Fare, fun place for drinks and to enjoy the local crowd. SeaWorld takes you on a one-of-a-kind journey to the wonders that exist beyond the oceans door. "I-Drive" is Orlando's International Drive, and is Orlando's destination for attractions, shopping, dining, entertainment, Orlando hotels, lodging and more!